How Do Coal Power Plants Work? "How does a coal power plant work?’ you may ask. Well, a coal fired power plant converts heat to electrical energy in much the same way that it’s done in a gas fired power plant, a nuclear power plant, or even a solar thermoelectric power plant. The only thing that differs among these different types of power plants is the way that the heat is generated. 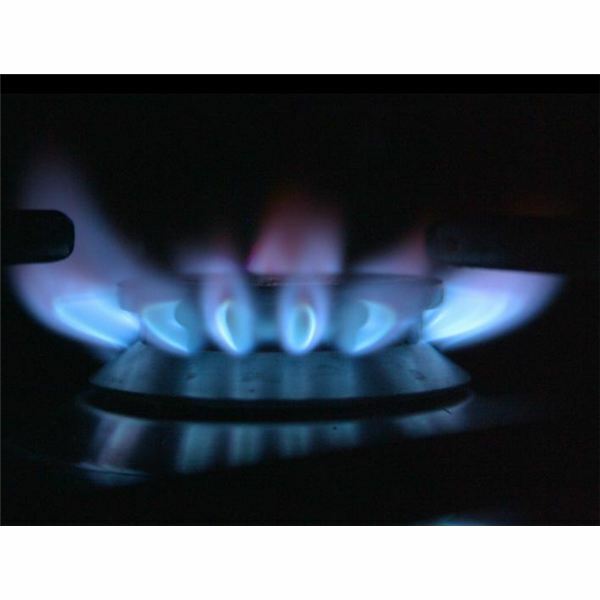 Coal power plants and gas or oil fired power plants burn a fuel to generate heat. A nuclear power plant carries out a controlled nuclear reaction that generates heat and a solar thermoelectric power plant uses solar radiation to heat a fluid. In all of these thermoelectric power plants, the heat is used to heat water and generate steam that is then passed through a steam turbine, making it rotate and drive an electrical generator. Thus a thermoelectric power plant converts the energy in coal, gas, oil, nuclear fuel, or the sun’s rays into electrical energy. 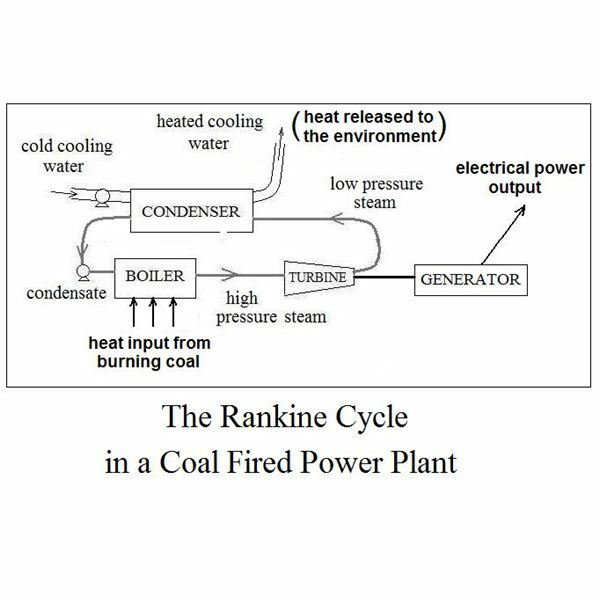 The Rankine cycle is the name for the sequence of processes briefly identified above that are used to convert heat to electricity in a continuous process. The heat can be generated by burning coal, as in a coal fired power plant, or by burning a different fuel, carrying out a nuclear reaction, or collecting solar energy. 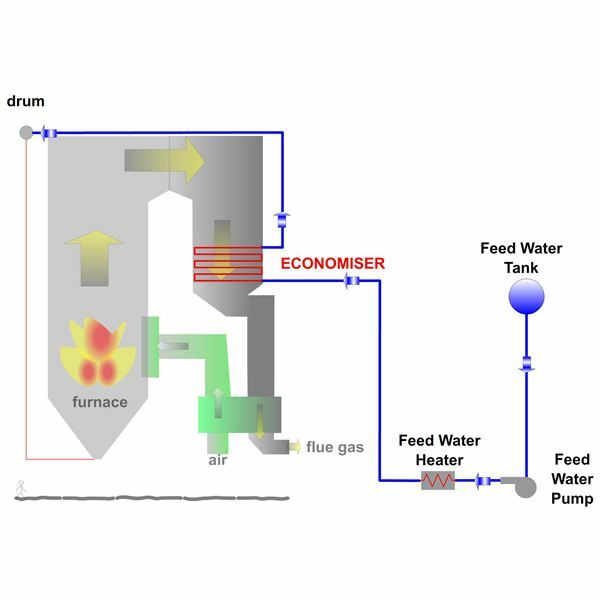 As shown in the schematic diagram at the left, the heat from the burning coal is used to generate high pressure steam in a boiler. The high pressure steam is sent through a steam turbine, thus making it rotate, and comes out of the turbine as low pressure steam. In order to keep all of this going as a continuous process, water must be continuously pumped into the boiler, since steam is continuously leaving the boiler to go into the turbine. Thus the low pressure steam must be condensed back into the liquid state, so it can be pumped into the boiler under pressure. The useful output of the Rankine cycle is the mechanical power of the rotating turbine. The turbine is used to drive a generator, which produces the electrical power output that comes from the coal fired power plant. boiler that produces steam to drive the turbine. An advantage of coal as a fuel for electric power production is that it is the most abundant fossil fuel in the United States. About half of U.S. electric power is generated by coal fired plants. A disadvantage of coal is that it is a rather dirty fuel. That is, it produces significant amounts of air pollution if burned unchecked. A modern coal fired power plant uses a lot of air pollution control to keep the emissions under control. Also there is a need to mine the coal to get it out of the ground, transport it to where it is needed, and process it to make it usable as a power plant fuel. In a typical coal fired power plant, coal is pulverized to a powder before being burned in the boiler. More details about the pros and cons of coal as a power plant fuel are available in other articles. Even without knowing anything about the second law of thermodynamics, one can see that some of the heat energy generated by burning coal in a coal fired power plant must be discarded to the environment as waste heat. As shown in the schematic diagram above, it’s necessary to remove heat from the low pressure steam in order to condense it to a liquid that can be pumped as feed water into the boiler. Higher temperature for the steam leaving the boiler and lower temperature for the condenser cooling medium, lead to a higher maximum possible efficiency for a thermoelectric power plant. 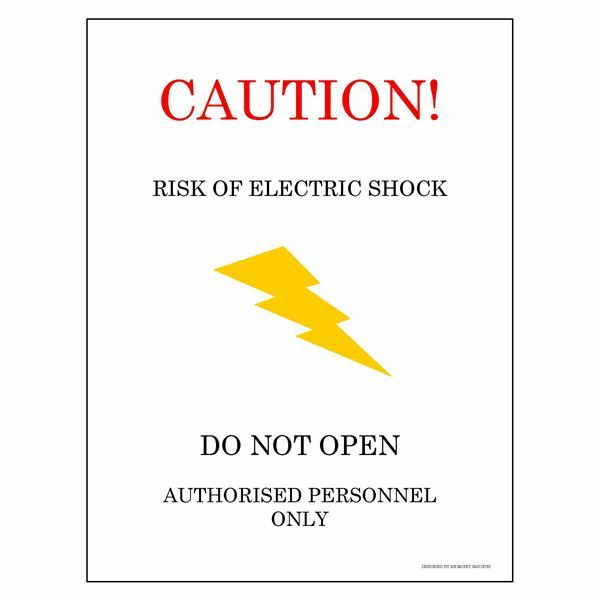 Many physical limitations make actual power plant efficiencies much lower than the maximum possible. Most coal power plants (and other thermoelectric power plants) have an overall efficiency less than 35% for conversion of the energy in coal (or other fuel) into electrical energy. Much more information about coal fired power plant efficiency is available. Some aspects of an answer to the question, ‘How Does a Coal Power Plant Work?’ are given here. The basic processes are conversion of the chemical energy in coal to heat, then to mechanical energy, and finally to electrical energy. 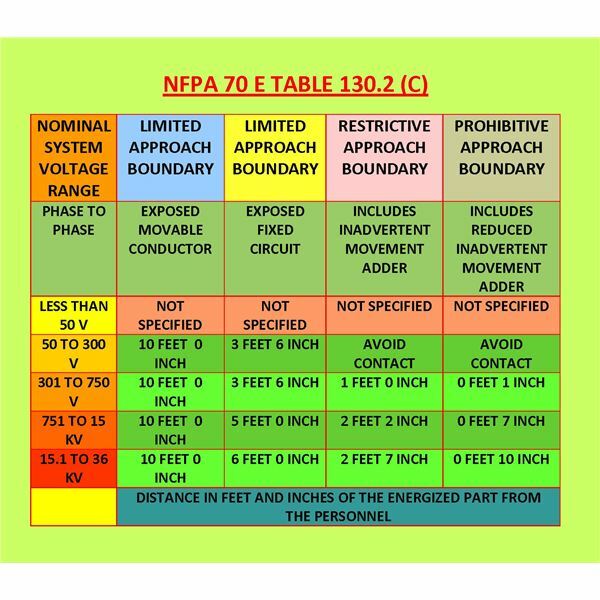 Most of the steps in a coal fired power plant are common to all other thermoelectric power plants. 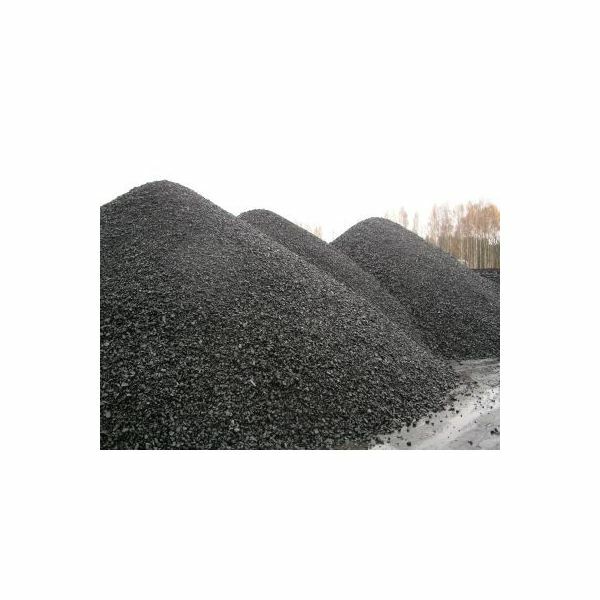 The use of coal as a fuel in coal power plants presents some challenges, however, because of the need to mine, transport, and process coal to make it a suitable fuel for coal fired plants. Also coal burning is dirty by nature and produces a lot of air pollution when burned.